I’ve been using Apple’s Bluetooth keyboard and mouse on a daily basis for around seven years. The design is delightful, and the gadgets are pretty dependable. I spent a day with Apple’s new Magic Keyboard and Magic Mouse. Typing is suddenly fun again. Apple just released three things, actually. 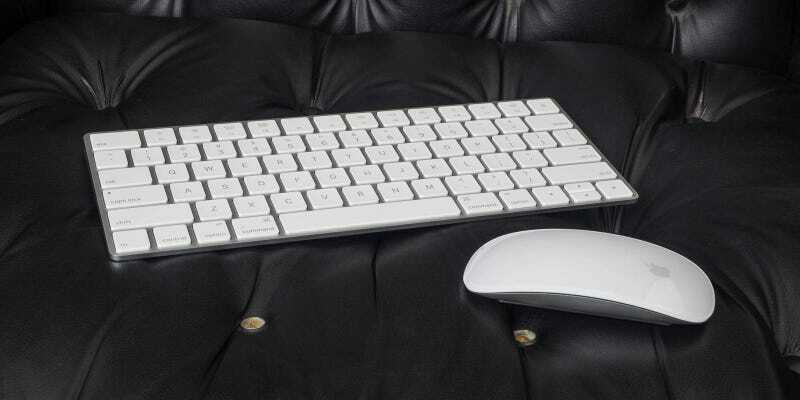 In addition to a redesigned Bluetooth keyboard a very-much-the-same-design Magic Mouse, the company revealed a touchpad with ForceTouch capabilities. I don’t have much use for a touchpad—like a lot of people, I suspect—so I compared the new keyboard and mouse to the previous version that I’ve had on my desk for years. We’ll be taking an in depth look at the new TouchPad soon. For the sake of brevity, let’s talk about the Magic Mouse 2 first. Save for some smoother lines on the edges, it’s virtually identical to the Magic Mouse 1. That’s a good thing because the original design is uniquely pleasing. The big difference is that the Magic Mouse 2 is rechargeable and doesn’t have a battery compartment. You plug the Lightning cable into the bottom of the mouse to charge it, so you can’t actually use it while it’s charging. Is that a big deal? I’m not sure. If you plan ahead and charge it while you’re away from your computer, it’s probably fine. If your mouse suddenly runs out of juice during the workday, it’s less fine. Using the new Magic Mouse is a lot like using the old Magic Mouse. To be perfectly honest, I couldn’t tell the difference. Some have said that it’s “not quite as clicky” as the old one. But maybe that’s just the joy of using a brand new mouse. It costs $80. Where everyone will notice a difference is in the all new Magic Keyboard. Shaped like the world’s most beautiful doorstop, this wedge of a device fits flush on your desk. Unlike the wafer of a keyboard that was the old one, the new Magic Keyboard is lightweight but a noticeably more solid piece of hardware. This geometry makes good sense, as it does away with the annoying rattling problem I’ve noticed on its predecessor. It also sits a little bit lower, so it’s slightly more comfortable. What the hell does that mean? It does not mean that the keyboard has the same butterfly mechanism that’s in the new MacBook. The keyboard layout is very similar to the new MacBook, though. Having typed on both, I’ll admit that I prefer the Magic Keyboard. The keys feel noticeably more stable. It also felt like typing took a little bit less effort than the older Bluetooth keyboard. Whether or not that’s thanks to “optimized key travel,” I can’t say, but pressing the keys is just more buttery. Like the Magic Mouse 2, the Magic Keyboard comes with an internal battery that you charge through a Lightning cable. Thankfully, Apple decided to put the port in a sensible place—it’s in the center on the back, not the bottom—so you can type and charge at the same time. You’ll also notice that Apple’s done away with the smaller key size, favoring a grid of full-size keys that aren’t really that hard to get used to. The new keyboard costs $100. The real question you’re asking yourself shouldn’t be whether these are good gadgets. They’re both meaningful upgrades to a great pair of products, though one upgrade is more meaningful than the other. What you should be wondering is whether or not to fork over the $180 for a full upgrade. If you’re buying one of the new iMacs, you decision is pretty easy because you’ll get a new Magic Keyboard and Magic Mouse 2 in the box. If you need a new keyboard or mouse, you’ll probably like what Apple’s done here. If you’re enjoying the previous generation but really hate replacing batteries every other month or so, the rechargeable feature is for you. If you’re pretty happy with your regular old Magic Mouse, you’re probably not going to notice a difference in the Magic Mouse 2 beyond that battery-free detail. The keyboard is a different question. It really is fun to type on, and I like the sturdier design. Like I said, it’s hard to switch back to the old keyboard, but it’s not the end of the world.